Mary Hamilton served as Assistant Director for the Sunnyvale Singers for a year before becoming our seventh director in the Fall of 2013. Mary has been singing all her life including in high school and college choirs, community choirs, and caroling groups. 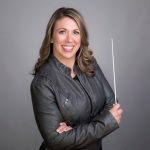 She has always loved music and discovered the exquisite beauty of choral music at a young age, but figured out that she wanted to make music her life work about 15 years ago. Mary has a Bachelor’s degree in Earth Sciences from Stanford University and a Bachelor’s degree in Piano Performance, Music Education, and a Teaching Credential from San Jose State University. Mary has accompanied choirs and toured in Europe with her children for 10 years with the Cantabile Youth Singers, founded by Signe Boyer. She also sang on tour in Germany, Austria, and the Czech Republic in 2010 with the SJSU singers directed by Dr. Amanda Quist. Mary sings in a local chamber choir, Collage Vocal Ensemble, teaches chorus to middle school students in Los Altos, and lives in Mountain View with her husband and cat. The Sunnyvale Singers are the happy beneficiaries of Yuko Otaguro’s excellence as a pianist and accompanist. Yuko grew up in Yokosuka, Japan, where she began studying piano at age 6. She went to college in Tokyo, majoring in Asian History. After college, she continued her piano studies and spent five years as a member of the Kanagawa Piano Club, an amateur piano group. During this time she had the opportunity to accompany violin, flute, and cello players. Yuko came to Sunnyvale in 2001 with her husband and two children (who all also play the piano!). Two years ago she began serving as an accompanist for local music students, one of whom was the daughter of a choir member. Happily, this led her to the Sunnyvale Singers in the Fall of 2009.